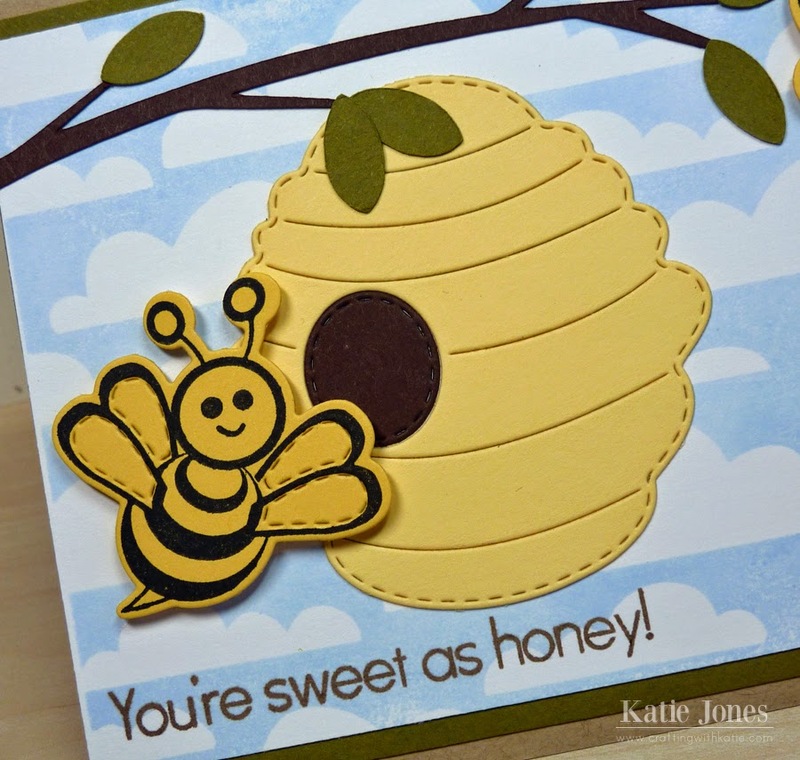 It's another day of My Creative Time sneak peeks, and today's adorable stamps and dies all have to do with bees!!! Aren't they the cutest? To start off my card today, I stamped the MCT Cartoon Cloud Background Stamp on white cardstock with soft sky ink. Then I cut out a branch with my Silhouette. One of the sets we are sneaking today is the Stitched Bees & Beehive Dies. That's how I made the adorable beehive hanging from the branch and this sweet little bee. I stamped the bee with a coordinating stamp from another set I am sneaking today, Bee Happy. The sentiment is from Bee Happy as well! Here's another sweet bee made with this set; there are four in all! I made the little trail using a stamp from MCT's Fun Paper Airplane Die. Such a CUTE card Miss Katie!!!! I just LOVE how it came out!!! Love the background with these dies and stamps. 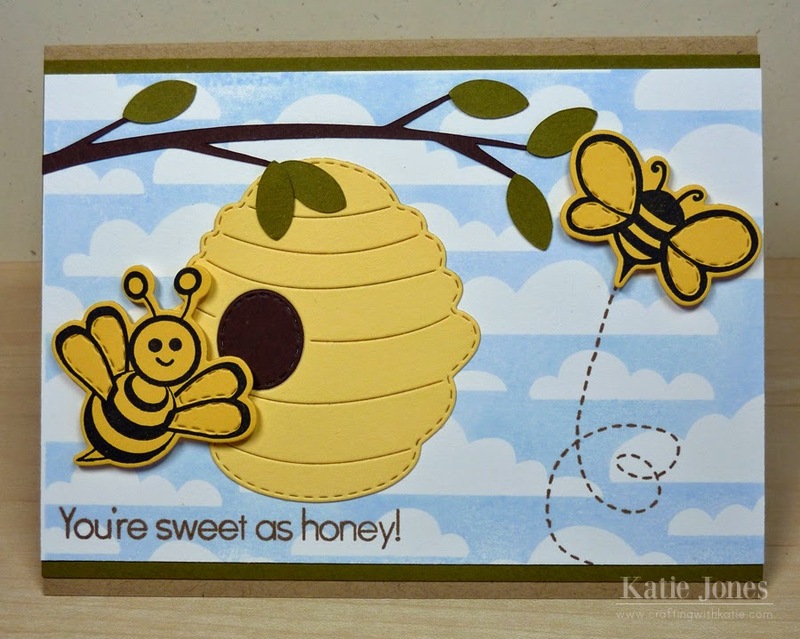 Beautiful bee card! I love that you incorporate the tree branches with the hive. I just love how these are just buzzing around. Also love the background. 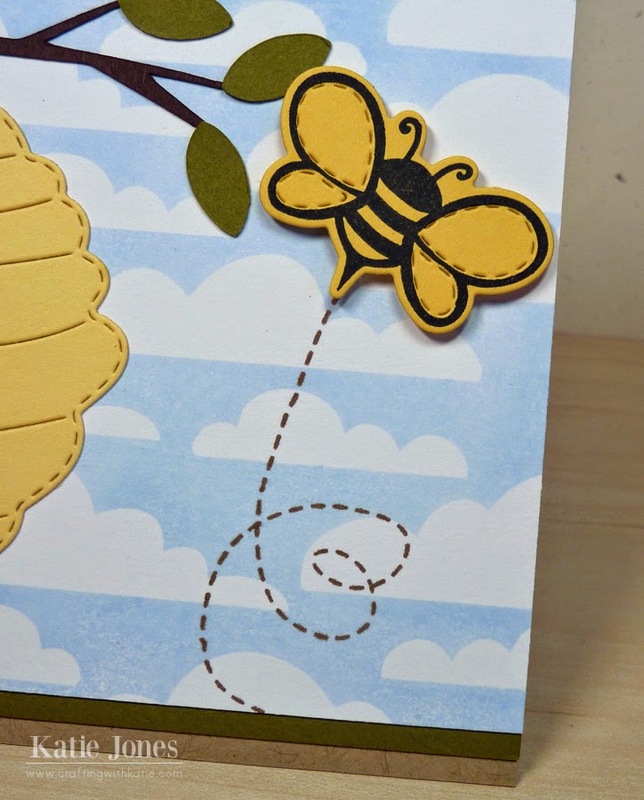 Love how you used the airplane stamp to simulate movement for your cute bee! AWWWW what a cutie of a card you did such a sweet card love your honeycomb with the busy little bees just so darling. Love too how you have the hive hanging from the branch super great creative card. I'm so stoked about todayz goodiez and can't wait to get it all. You did one amazzzzing & creative job. YOU ROCK!!!! Such an adorable card Katie!!! LOVE the cloud background idea too!! sweet honey of a card! Such a sweet card! That cloud paper is the perfect backing paper! Thanks for sharing! So cute! The tree branch adds a lot of interest to it and sets it apart. Katie ` What a BEE~utiful scene card!! I LOVE that you used the cloud background ~ the blue makes everything pop! !Then the branch ~ ADORBS!! Awesome job as always plus I LOVE the heart squiggly thing too!!! Hi Katie you did a great job on your card I am loving this stamp set you are so talented. So super cute! These bees are just adorable. I am in awww over your projects you made. TFS! I love how you added the hive to the branch, Katie. The cloud background is the perfect backdrop. I'm so glad you always put the supplies you used at the end of your post. I've been looking for a good color ink to use with the background cloud stamp. I'm going to have to get some of that sky color ink you used because it looks perfect. Your card is so cute as usual. Very summery feel to it. Bees are adorable. Darling card. Love the hive is hanging from a limb. The flight pattern for the bee at the bottom was cute too. Wow... great card... I love everything about it, the limb is a perfect background. I'm looking forward to the release! Very cute and the cloud background in perfect. Just love your colors that you used! HONEY ANYONE??!!! Oh yes love it all! Very cute card. I love the cloud background, it's perfect for the bees and hive. Adorable! One of my all-time favorites! super cute card:) Thanks for sharing. Aw your card is so cute. Thanks for sharing. This is a very cute card! Wow, I love your card, you did a great job, thanks for sharing by the way I love the sentiment! Love the bee hive hanging from the branch. Such a cheery card. This is so cute!! I love how you did your background!! Hugs!! Don't you just love the bees? I do! Your card is so cute with the 2 of 3 kinds of bees...so glad we have choices. Your hive on a branch and cartoon clouds is adorable. Great job! I hope your recovery is going well...good to see you are crafting. Love your card!! The cloud stamp is great for this card! The little bee are so adorable! !